Deer population density in Beverly Shores has fluctuated widely over time. Prior to European settlement, the population density of white-tailed deer in North America is estimated to have been on the order of 8-11 deer/mi2, but as the human population expanded, the deer receded. By 1900, Indiana's white-tailed deer population had been “wiped out.” (Indiana Dunes National Lakeshore, Final White-Tailed Deer Management Plan/Environmental Impact Statement, page 9. We refer to this plan below as IDNL Plan.). When Beverly Shores was first developed, there were no deer in the dunes. White-tailed deer were reintroduced in Indiana in 1934 (IDNL Plan, page 9). The deer population here grew slowly. According to a manager at the Indiana Dunes State Park, the deer population a half-century ago was approximately 2-3 per square mile (personal communication). But just over fifteen years ago—when the Beverly Shores Environmental Restoration Group (ERG) did its first flyover census—the population in and around Beverly Shores was over 200 per square mile, a density almost 100 times what it had been just a few years before. The result of this overpopulation was predictable. The understory of the Beverly Shores forest was severely damaged. As deer destroyed much of the native undergrowth, garlic mustard took over. It became the bane of Beverly Shores residents' existence, as many residents had to become accustomed to the spring ritual of stooping to pull up the invasive plant. Garlic mustard—which deer will ordinarily not eat—proliferated, replacing native plants. 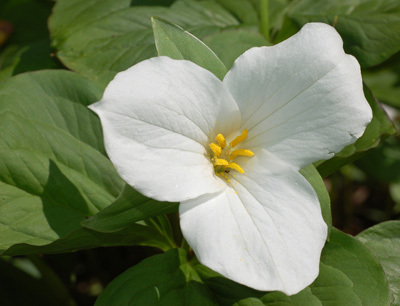 The impact of Beverly Shores' deer overpopulation has been to demolish populations of desirable species such as trillium, to plague gardeners who try to grow exotic species such as hostas (“Apparently, when deer see hostas, they think salad bar.” How to Stop Deer from Eating your Garden), and reduce the town's songbird population. After a vigorous debate within the town, fifteen years ago the ERG conducted the first hunt in Beverly Shores. Since then—as predicted by Bob Beglin—the resurgence of wild flowers has been truly amazing. Other benefits include a reduced risk of lyme disease and automobile accidents plus reduced damage to gardens and landscaping. And the dramatically improved health of the deer population is clearly demonstrated by the doubling of the weight of deer harvested. So both the town and the deer have greatly benefited. Every year since, hunts have been approved by the Beverly Shores Town Council and conducted under the Indiana Department of Natural Resources (InDNR) rules; archery hunters have met rigorous qualification tests beyond InDNR licensing; properties used have been approved by owners; and no more than ten hunters are allowed in town at one time. ERG in 2014 was awarded a three year grant from the InDNR which provides some expense reimbursement to assist with managing deer through the use of public hunters and hunting. As the deer population has been reduced, the number of deer taken in Beverly Shores has declined annually. The winter of hunting in Beverly Shores, 2001-2, resulted in approximately 70 deer taken. In the next three winters, the figures were 53, 144, and 107 (IDNL Plan, page 15). Contrast those numbers to 2013-4 (22 deer taken) and 2014-5 (18 deer taken). Deer numbers are now much lower than at the peak at the beginning of the new millennium, but deer density remains well above the NPS target density. Indeed, the number of deer remains well above our target deer population maximum (See our census results, on the flyover census page). In 2012—after a ten-year environmental impact study and public hearings—the National Park Service started conducting culls of its own. The culls have been more productive each year and have clearly contributed to the programs of Ogden Dunes, Dune Acres, and the Shirley Heinze Land Trust, as well as Beverly Shores. Communication among these organizations has also improved greatly not just in deer control, but in the management of invasive species like the tree of heaven. If you have any questions or concerns about our program, drop us a note at the address below. And consider adding a contribution to ERG in your letter.